Rubber Sheet – Standard Industrial Inc.
With the widest product range in the market, StandardA can deliver rubber sheeting and rubber matting, quickly and reliably for all areas of use. Common applications include sealing, bearing parts and protection. Our extensive range of rubber matting products is suitable for most uses and is extraordinarily tough in all applications like public places as rooms, shops, restaurants, stairways, entrances, airports, buses etc. put on the workbench or used as rubber matting. With Excellent resistance to oils, solvents and fuels. Resistant to a broader range of aromatic hydrocarbons than neoprene. 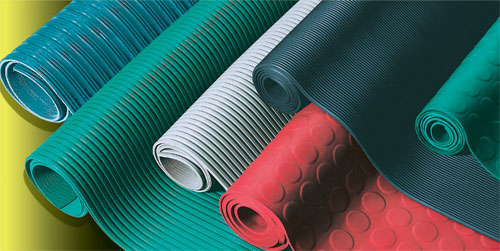 Nitrile may be blended with SBR rubber to achieve an economically priced sheet or moderately oil resistant applications. Resistance to chemicals; resistant to inorganic chemical products , except oxidizing acids and halogens. Excellent resistance to ozone, sunlight and oxygen. Excellent resistance to acid, alkali and ketones. Silicone rubber is physiologically inert, thus making it the preferred choice of the medical, pharmaceutical and food processing industries. even at high temperatures but should not be used with high pressure steam. 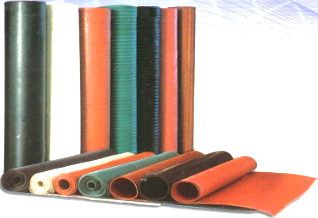 Resistance to chemicals; its resistance to oils and hydrocarbon products is fairly limited and similar to that of Chloroprene rubbers. Reasonable resistance to a whole range of general chemical products, but acids, alkalis, esters and ketone should be avoided. 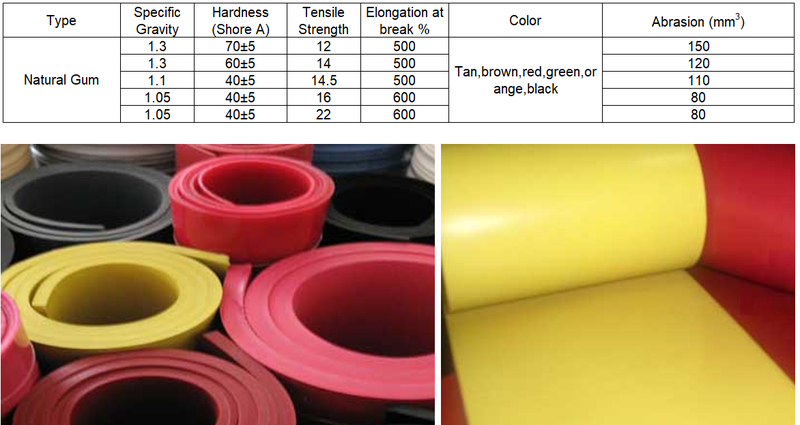 Have excellent resistance to oxygen, ozone and natural weathering..
Natural rubber is used effectively as sand and shot blast curtain material because of it’s high abrasion resistance and resilience.